Stories: The Path of Destinies is a video game that blends traditional action-RPG with choose-your-own-adventure style. This makes for a game that you must play through multiple times in order to “win”. 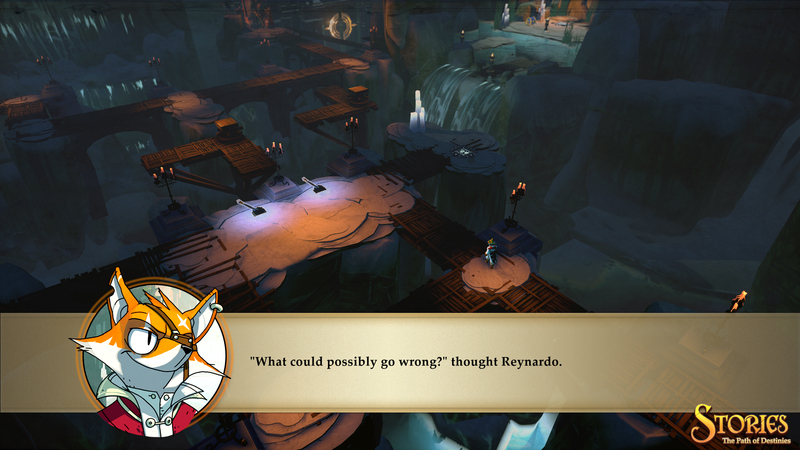 In Stories, you play as Reynardo, a fox fighting in a rebellion against the frog king, who has become corrupted by Lovecraftian horrors. 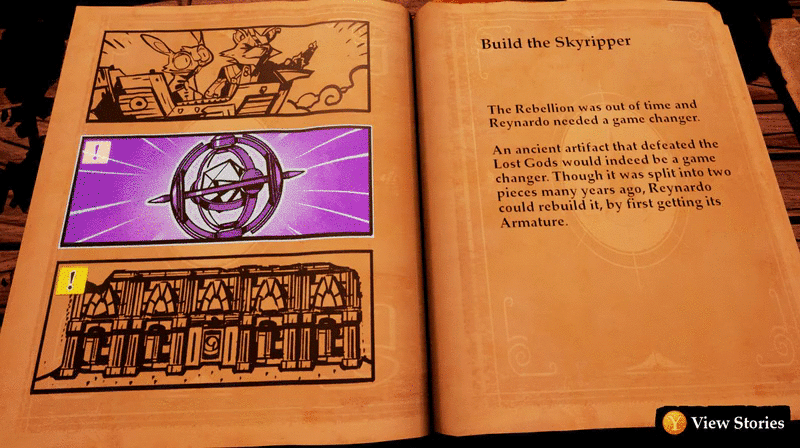 Within the first few minutes of the game, you have rescued a magical book. Apparently, this book helps you to see the future… or at least, a possible future. Each chapter of the game presents you with a choice. Once you choose, you are placed into the scenario flowing out of your choice. Fight monsters and upgrade your abilities as you move to the end goal of each chapter. As you progress from chapter to chapter, you begin to learn some new information… oh, if only you had known it earlier! Once you reach the final chapter, you will almost certainly die… except you’re not dead! You’re back at the beginning of chapter 1, but this time, with knowledge to make better choices. Play through at least 4 times to gain all 4 pieces of essential knowledge to make it possible to find the only path that lets you win the game. End-of-chapter choices aren’t the only place where paths can diverge; you will see doors that can only be opened with certain weapon upgrades. Most of these doors hide additional rewards, but some also open new paths to navigate the environment. Cleverly, although there are limited world-environments to explore, each level is re-purposed for different chapters. You may be able to see a path you’ve used before without being able to get to it (blocked with burning rubble, etc.) which feels a bit like the old Metroid or Castlevania games. Stories is an easy game to play. Fighting is smashing enemies with a sword or throwing them at each other. There are techniques to fight “better”, but simple button mashing will mostly work. Upgrades come regularly, but enemies upgrade with each playthrough, so they’ll never be too easy. You don’t need to explore each and every path to find some upgrade or object you need, either. Exploring thoroughly will bring more rewards and sometimes extra bits of information, but nothing critical to making your choices. It’s also a fast-moving game. Each chapter only takes 15-30 minutes, which means only 1-2 hours for each playthrough. If you become interested in piecing the story together, you will easily play over and over again, each time with more knowledge and skills. I loved how much humor there was in Stories. Simple puns (reynard is French for “fox”; our main character is a fox named Reynardo), gaming jokes (“inside the chest was: nothing useful. And some jewels!”), and lots of one-liners (“These elevators were invented by Elon Muskrat“). This game is simply beautiful. The majority of the gameplay is in a world of floating islands, shown at an isometric perspective. Striking line-drawn “illustrations” give interest to the story within the “book” between chapters. The ESRB rates Stories as T for Teen. There is nothing inherent in the gameplay or story that isn’t appropriate for a pre-teen (some romance and obviously some violence), but there is casual use of less-than-good language you probably don’t want your pre-teen to copy. We started off playing the game in front of our kids and then quickly decided we’d better not, mostly due to the language. We played on PlayStation 4, and in a certain chapter, I repeatedly hit a bug that would make part of the environment disappear. This was disappointing, but usually solved by restarting the chapter. Most times I took it as a sign I’d been playing too long and needed to shut the game off and take a break. I don’t normally have a lot of time for video games, so I really appreciate ones like Stories that reward me by making it easy to advance the game while still feeling like I’ve achieved something. I found the story very interesting; it gave sufficient detail that I began to care about the characters and how Reynardo could possibly assist the rebellion and thwart the evil king. I had to replay a few of the same decision points until I was beginning to grow tired of them, but there was less replaying than I expected. The new content revealed by my decisions kept me coming back to find the path that could make everything work together. Stories: The Path of Destinies retails for 14.99 (but often goes on sale for less). It is available for PC and PS4.